Disclaimer - I didn't come up with that #Limsanity thing. But I think it's pretty spot on. Since today is still so fresh in my mind, I thought I would write up my Phillip Lim for Target experience now. This is actually my first time participating in a a Target collab on launch day. I literally had dreams all night about waiting in line outside the store and not getting anything. I have been waiting for this day for at least 6 months. I remember hearing about the collab in early Spring and knowing that I had to get my hands on one of his signature bags! Last night I thought, why don't I just order online like I did when the iPhone 5 came out??? No waiting in line or dealing with crazy women. But there was no clear time posted about when the pieces would be available online. I checked before I went to bed and the website still looked the same - nothing available for sale yet. I kept waking up throughout the night and finally woke up around 6 am EST. I checked the website on my phone and all the purses I wanted were sold out online. 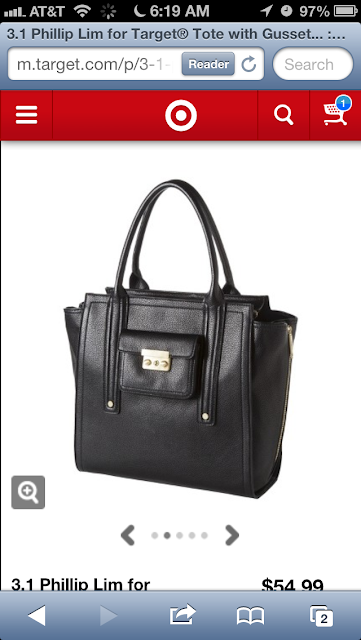 I kept refreshing my page and finally "The Large Tote in Black" showed up as available. I had to act quickly! I should have put my credit card info ahead of time. By the time I signed in, punched in my credit card number as fast and humanly possible and clicked "Checkout"! 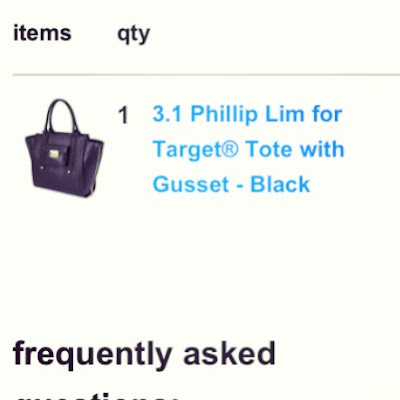 Noooo... it said the item was unavailable. I waited a few more minutes and tried again.. Success! I knew I struck gold when I got my email confirmation. I was way too excited to go back to sleep. I had a huge adrenaline rush from knowing that I had at least one bag in the bag (pun intended). I knew that I should just get ready, go to Starbucks and head to the store to try and get the other purse I wanted "Top Handle Crossbody". My next problem was figuring out what color I wanted to get. 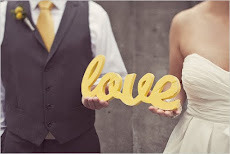 I was obsessed with the yellow but thought maybe it was too bright for a 28 year old... 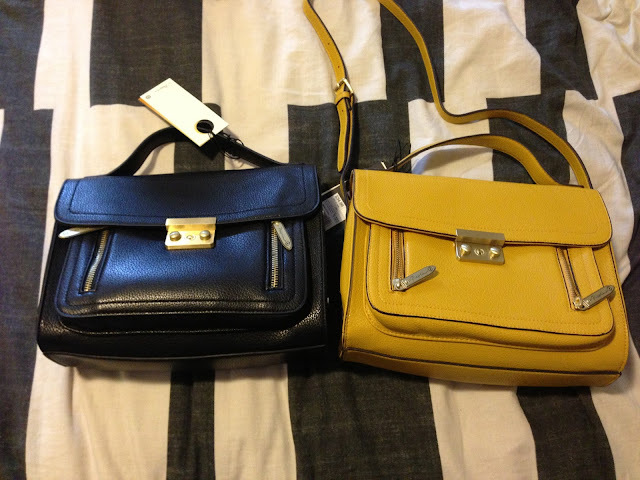 I told myself I would just grab a yellow and black one to compare and HECK - If I liked both, I could get both. They were only $35 each for goodness sakes. 6:30 Left the house and headed to Starbucks. Grande skinny vanilla latte, thankyouverymuch. 6:55 Arrive at Target. Look around, don't see anyone outside the door... So I figured I would wait in my car. It was a cold 66 degrees, people. 7:10 A van pulls up and a bunch of kids and their parents get out and head to the door. Oh no, I thought. I'm not gonna let these people buy up all the stuff and sell it on eBay for ridiculous prices. So I jump out of the car and notice a couple other people trying to make their way to the door. 7:15 Turns out the family was just looking for Starbucks. Whew! They are gone, and now there are about 4 of us waiting in line at the door. We thing the Target workers probably think we are currazy. We are. 7:30 A couple more people join us. We wait in anticipation, trying to figure out where the purses are. We find out later that they are mixed in with the clothing section... Whaaat? 7:50 A big buff guy comes to the door and opens it a tiny bit. He goes, "you guys aren't waiting for the Phillip Lim stuff are you? Cause we didn't get any of it in". I go - "Yeah Right!" He smiles... and closes the door. 7:58 Security guard gets in place near the merchandise. My heart is racing! The hype! 8:00 The doors open slowly. I am the 2nd one in. They are yelling at us not to run and the Target employees are taking pictures of us fools. The guy points us in the direction of the bags. 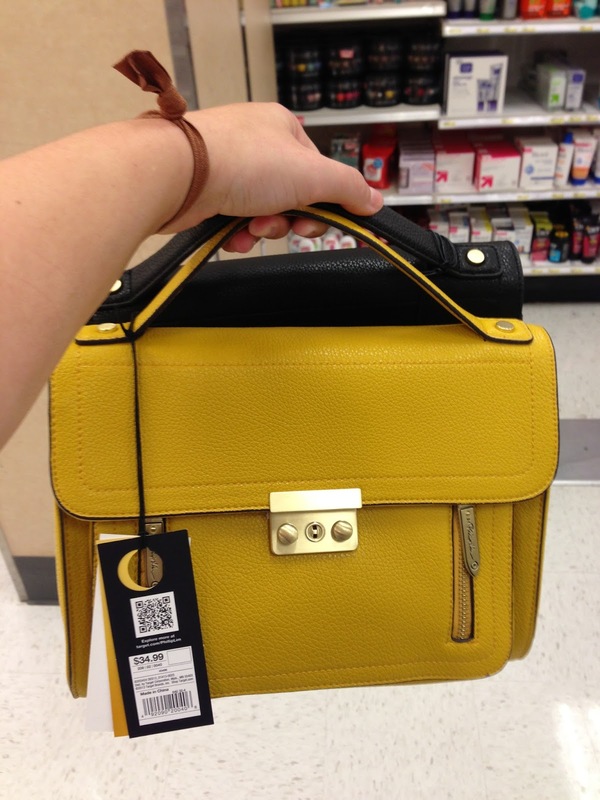 I grab the first yellow crossbody bag I see! Whew! The 2 other yellow bags are swiped in seconds. I also grad a black one since I can't decide! 8:15 The adrenaline is pumping! I got everything I wanted but I wouldn't have if I didn't get there exactly when I did. What a fun shopping experience. I tried on a couple tops but ultimately didn't like how they fit. Plus, in the end, I really only cared about the bags. I think I'm keeping both! Can't resist a good handbag! Did you score anything from this line? Someone posted a few pics of the men's tshirts and I gotta say I am interested! I think I'm going back for round 2 later today. Gotta love it!